Today, I’m reviewing Sophie Jordan’s Firelight, after staying up last night reading it. So please forgive any typos and I will try my best to…to…zzzzzz…. This book grabbed me fast. Jacinda, a compelling young woman seeking her place in the world–or worlds, is bombarded and influenced by the needs of others. I like this–Jacinda’s dilemma resonates in her world. The people she associates with (or is related to) are greedy, self-centered and self-serving most of the time. Rarely do they think about what their choices are doing to her. And as luck would have it, every time Jacinda tries to do her best or is pulled in the direction she knows is better for her, she gets kicked in the gut for it. Sucker punched. I love when I find a book that I cannot stop reading until the end. 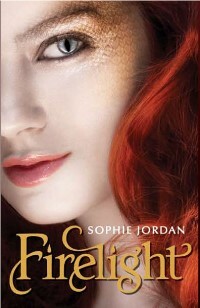 Firelight is one of those books, in my opinion. It left me wanting more, and I am very glad the other books in the series are out now. Yippie. Plus there is a novella. The only thing that irritated me was the constant repetition of facts already established in the story. I understand that this is sometimes necessary in the current-day forgetful world. The editor should have had more confidence in teenage readers–they have better memories than most adults. Not that I even have to say this, but “Firelight” hit all the right marks. 5 stars, easily.